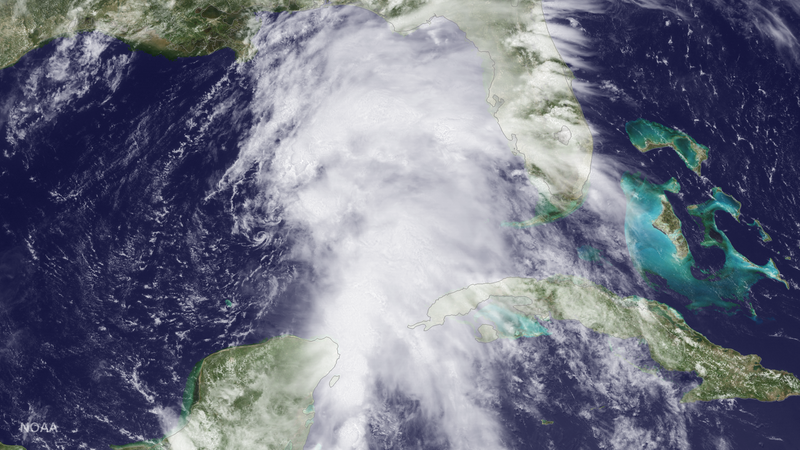 GOES-East visible image of the Gulf of Mexico on the afternoon of June 19, 2017, when NHC began issuing advisories on Potential Tropical Cyclone Three, which eventually became Tropical Storm Cindy once it developed a well-defined center of circulation. Two years ago this month, Tropical Storm Bill made landfall along the central Texas coast, just 17 hours after becoming a tropical cyclone only 145 miles offshore. The precursor disturbance, a broad and ill-defined area of low pressure, had already been producing tropical-storm-force winds, and there was little doubt that the system would soon bring those dangerous winds onshore. Although NHC’s Tropical Weather Outlooks had been talking about the possibility of those conditions two days in advance, and their likelihood one day in advance, some in the media and emergency management communities lamented the lack of earlier formal tropical storm warnings and full advisory products from NHC. A few even suggested that NHC classify the disturbance as a tropical storm when it wasn’t one. By policy and tradition, NHC advisories, track and intensity forecasts, and any associated watches and warnings begin only after a disturbance has become a tropical cyclone; in this case a tropical storm warning was issued as soon as Bill formed, about 12 hours before the hazardous winds reached the coast. For some additional discussion on why warnings couldn’t have been issued any earlier for Bill, please see our blog post written after that event. This is hardly the only example of a tropical cyclone striking land shortly after genesis, and well within the normal 48-hour watch/warning time frame. In 2010, Tomas struck Barbados as a tropical storm 27 hours after formation, and St. Vincent and St. Lucia as a hurricane 38 hours after formation. In September of 2007, Humberto made landfall as a hurricane along the Texas coast a mere 19 hours after becoming a tropical cyclone. This recurring problem has been on our minds for a long time, and this season we’ve introduced a service enhancement to address the issue. Starting this year, NHC has the option to issue advisories, track and intensity forecasts, watches, and warnings for disturbances that are not yet a tropical cyclone, but which pose the threat of bringing tropical storm or hurricane conditions to land areas within 48 hours. This substantial change in policy means that we won’t have to wait for a disturbance to meet the technical requirements of a tropical cyclone (such as having a well-defined center of circulation or sufficiently organized thunderstorm activity) to issue forecasts or post warnings. And boy, it didn’t take long for us to employ this new option, with both the pre-Bret and pre-Cindy disturbances requiring the initiation of potential tropical cyclone advisories on two consecutive days! But more on that in a moment. 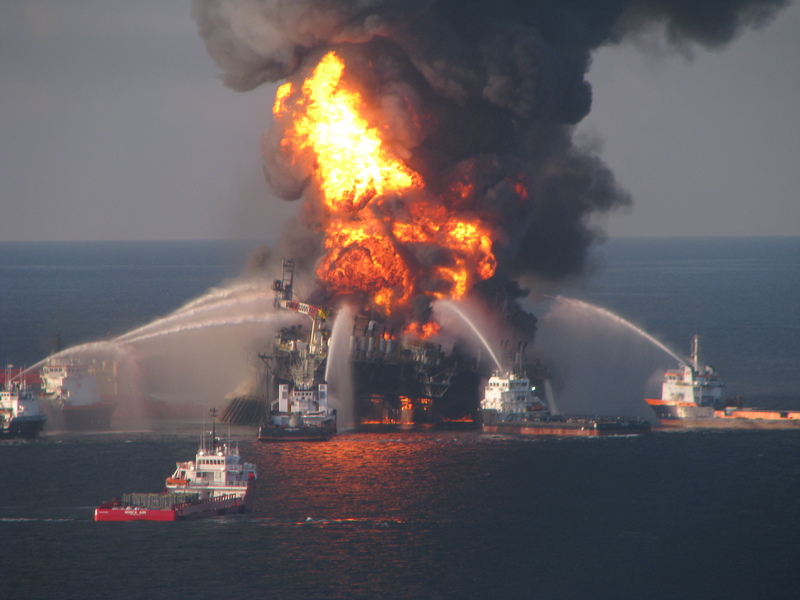 Although we’ve been working on the technical and administrative changes to bring this about over the past two years, the effort actually began after the Deepwater Horizon disaster in 2010, when NHC was asked to provide enhanced forecast support for the response effort. Since then, NHC has been practicing making track and intensity forecasts for disturbances, and at the same time we’ve been improving our ability to forecast tropical cyclone genesis. We now believe that the science has advanced enough to allow the confident prediction of tropical cyclone impacts while these systems are still in the developmental stage. For those who are interested in the definitions of each of these system types, you can find them in National Weather Service Instruction 10-604, Tropical Cyclone Names and Definitions. We did consider some alternatives to the term potential tropical cyclone. “Tropical disturbance” was a fairly obvious option but we knew that some of these precursor disturbances weren’t going to be tropical in nature (such as a frontal cyclone evolving into a subtropical or tropical cyclone), so that eliminated tropical disturbance. Another option was simply “disturbance”, which aside from evoking Star Wars imagery (I felt a great disturbance in the Gulf), did not in our view adequately convey the appropriate level of threat. In the end, potential tropical cyclone seemed both accurate and appropriate to the threat, although it’ll take a bit of getting used to for some. Potential tropical cyclones will share the naming rules currently used for depressions, with depressions and potential tropical cyclones being numbered from a single list (e.g., “One”, “Two”, “Three”, …, “Twenty-Three”, etc.). The assigned number will always match the total number of systems we’ve written advisories on within that basin during the season. For example, if three systems requiring advisories have already occurred within a basin in a given year, the next land-threatening disturbance would be designated “Potential Tropical Cyclone Four”. If a potential tropical cyclone becomes a tropical depression, its numerical designation doesn’t change (i.e., Potential Tropical Cyclone Four becomes Tropical Depression Four). Potential tropical cyclone advisory packages will be issued at the standard advisory times of 5 AM, 11 AM, 5 PM, and 11 PM EDT, with three-hourly Intermediate Public Advisories being issued at 2 AM, 8 AM, 2 PM, and 8 PM EDT when watches or warnings are in effect. The product suite will include a five-day track and intensity forecast, just as is done for ongoing tropical cyclones. In addition, the Potential Storm Surge Flooding Map and Storm Surge Watch/Warning graphic would be issued for these systems when appropriate. We’ll continue issuing advisory packages on a potential tropical cyclone until watches or warnings are discontinued or until the threat of tropical-storm-force winds for land areas sufficiently diminishes, at which point advisories would be discontinued. However, if it seems likely that new watches or warnings would be necessary within a short period of time (say 6-12 hours), then advisories could continue during that brief gap in warnings in the interest of service continuity. Since the primary issuance trigger is the threat of tropical storm conditions over land, there won’t be any specific threshold of formation likelihood for the initiation of advisories. For example, a fast-moving tropical wave approaching the Lesser Antilles might already have tropical-storm-force winds but no closed wind circulation. In this case, a genesis forecast of 40% – 50% would likely be enough to trigger advisories and warnings. In contrast, a genesis forecast of 70% for a system close to shore might not trigger advisories if the system were not expected to reach tropical storm strength before moving inland. The issuance of NHC products for potential tropical cyclones is very much analogous to the change that occurred after Hurricane Sandy in 2012, when NHC advisories on post-tropical cyclones became possible. After Sandy, we realized that there was great benefit to users in NHC’s being able to continue writing advisories on systems even after they were no longer a tropical cyclone. That solved the service continuity problem on the “back end”, and now we’re completing the process by ensuring a steady flow of information on the front end of a tropical cyclone’s life cycle. In all cases, we’ll be trying to ensure that warning types (tropical vs. non-tropical) don’t have to change in the middle of an event. There are some things to be aware of with this new capability. First, potential tropical cyclone advisories will not be issued for systems that threaten only marine areas – largely because this would pose an unmanageable workload/staffing issue for us but also because marine forecast products (the High Seas and Offshore Waters forecasts) already allow the issuance of gale and storm warnings before a tropical cyclone has formed. Second, because potential tropical cyclones will have a standard five-day forecast track and uncertainty cone, to avoid potential confusion with the cone we’re going to stop drawing potential formation areas for these systems in the Graphical Tropical Weather Outlook. An example of the Tropical Weather Outlook in which the potential genesis area for Potential Tropical Cyclone Two (pre-Bret) is not indicated east of the southern Windward Islands since advisories and an accompanying cone graphic were being issued by NHC at the time. We’re also concerned that some users may pay too much attention to the longer-range part of these new forecasts (the part beyond 72 hours). We know that forecast errors for weaker and developing systems tend to be larger than those for strong storms and hurricanes, and we even considered only going out to 72 hours with the new potential tropical cyclone advisories (since the primary purpose was to support watches and warnings). But in the end, consistency and technical issues argued for going out to five days, and that’s what we’re doing. So it’s likely that forecast-to-forecast changes in the longer-range portion of our potential tropical cyclone advisories will be larger than what folks are used to. And for those of you who like to look at forecast model intensity guidance, be aware that most of these intensity models assume the system is a tropical cyclone. Since that won’t be the case for these systems, intensity models run on potential tropical cyclones will generally have a high bias. And lastly, since many potential tropical cyclones will not have well-defined centers, there will likely be large jumps in the reported location of these systems from advisory to advisory. But even with all these caveats, we think that the ability to post warnings before a cyclone forms is an important service enhancement – one that will help save lives and protect property, while at the same time allowing NHC to analyze and report on tropical systems as accurately and as honestly as possible. After our experiences with Bret and Cindy, we’re optimistic about the value of this new capability. 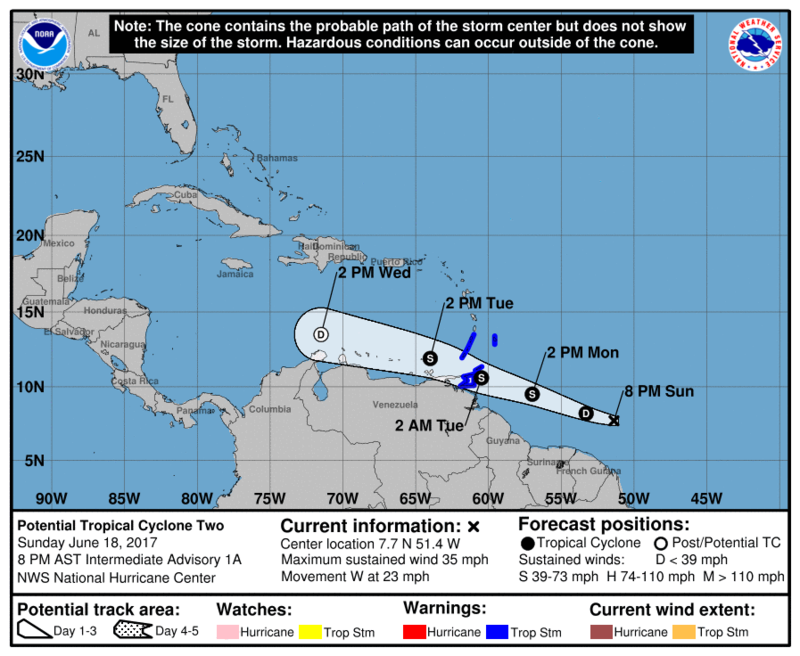 Advisories on Potential Tropical Cyclone Two were started 24 hours before Bret officially became a tropical cyclone, giving residents of Trinidad and Tobago, Grenada, and northeastern Venezuela an additional day of warning for tropical storm conditions. If this were still 2016, places like Trinidad may have only had three to six hours between the time of the first advisory and the time when tropical storm force winds began on the island. 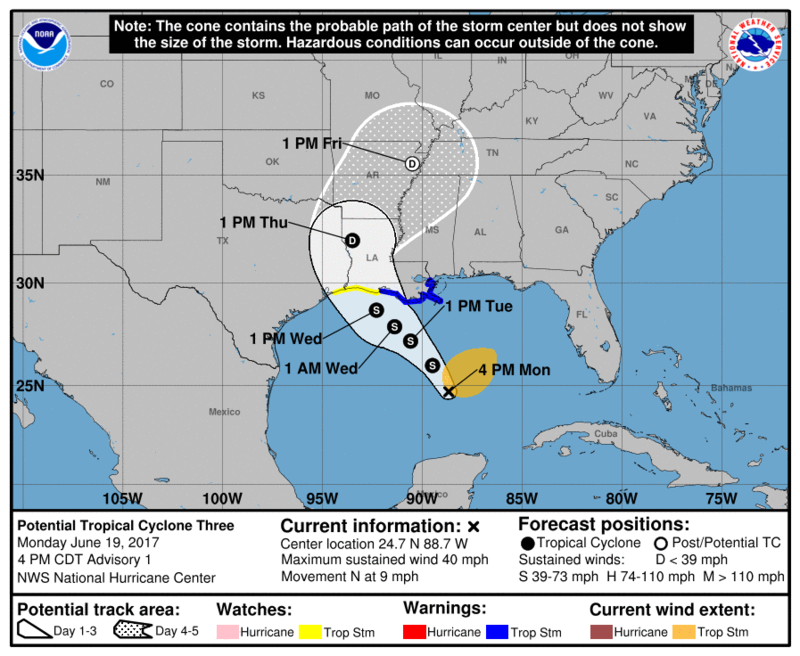 And for Cindy, advisories on Potential Tropical Cyclone Three were initiated roughly 21 hours before Cindy met the criteria of a tropical cyclone. This allowed Tropical Storm Warnings to be issued for southeastern Louisiana 21 hours earlier than they would have been if the storm had occurred last year. Just a few weeks into the new season, we’re pretty happy about the way this all worked. We think we successfully demonstrated the ability to provide more advanced warning than we could have in previous years for these developing tropical cyclones. But we’d love to hear feedback from our users, customers, and partners. 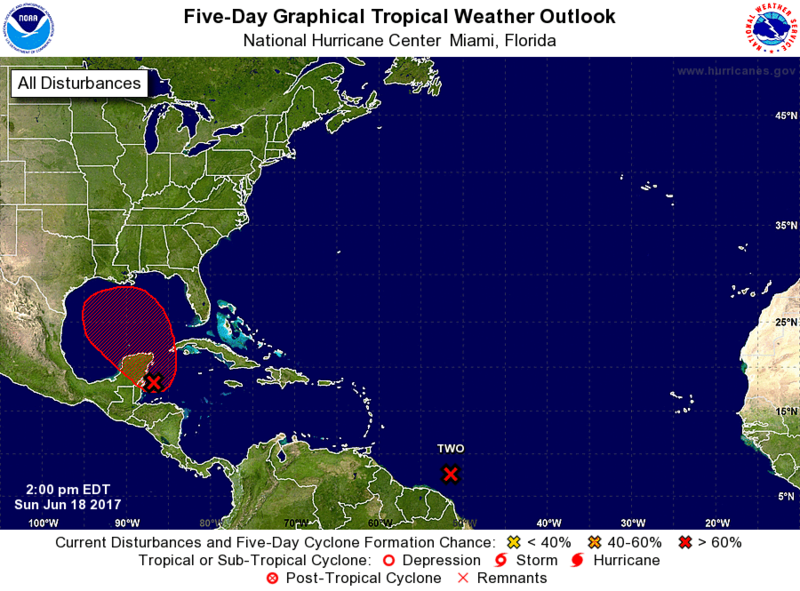 Were the potential tropical cyclone advisories in advance of Bret and Cindy confusing? Helpful? Maybe both? Or bad puns aside, did the new capability fit the “Bill”? If you’d like to provide comments on your experiences with the Potential Tropical Cyclone advisories during Bret and Cindy, please feel free to contact Jessica Schauer, the NWS Tropical Cyclone Program Leader, at Jessica.Schauer@noaa.gov. Editor’s Note: This post marks James’s last blog contribution as a member of the NHC family. After 35 years of service in the federal government (17 years at NOAA’s Hurricane Research Division and 18 years at the National Hurricane Center), James is retiring at the end of this week. We want to thank James for his contributions to not only the blog, but also for his many contributions to hurricane forecasting and NHC operations over the past several decades. Although James will no longer be “inside the eye” of the sometimes-hectic NHC scene, we know he won’t be too far away cheering on his beloved Miami Hurricanes, Miami Dolphins, and Florida Panthers. Congratulations, James, and happy retirement! This entry was posted in Forecasting, Genesis, NHC, Uncategorized and tagged Bill, Bret, Cindy, Deepwater Horizon, genesis, Humberto, potential tropical cyclone, Tomas.